Manufactured by V2 Tobacco for their popular Thunder snus brand, Thunder Raw Ultra Strong is an extra strong snus with a fast nicotine kick. V2 is known for making several high quality snus brands, and as a fan of the V2 line of snus, I was excited to get to try this new V2 offering. Thunder Raw snus has a very high nicotine content of 21mg of nicotine per gram, just slightly less than Oden’s Extreme 59 with 22mg of nicotine per gram of snus. 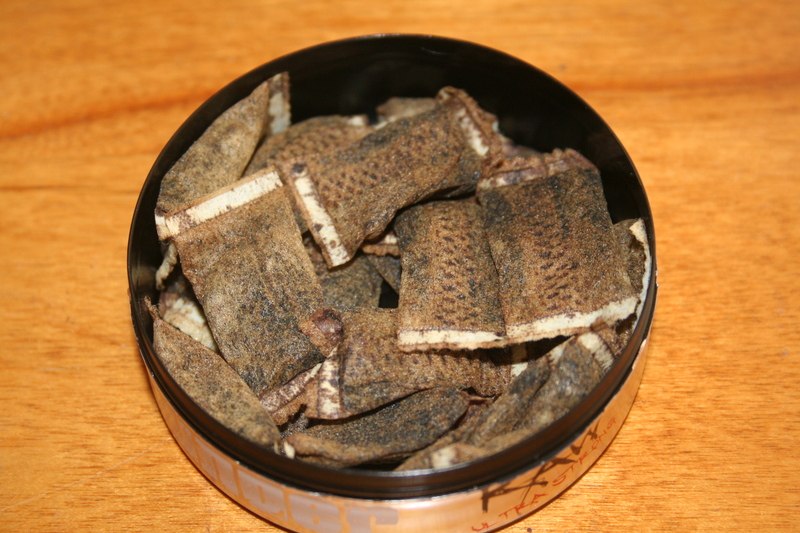 Each can of Thunder Raw contains 20 portions of snus. As soon as I opened my can of Thunder Raw, I was greeted with a strong minty smell, and a slight tobacco aroma. Upon placing a portion in my mouth, I noticed a strong minty taste which reminded me a lot of Thunder Frosted. I imagine that Thunder Raw is very similar in taste to frosted, but with a much higher nicotine content. After about twenty minutes, the sweet mint flavor began to give way to a salty tobacco taste, and the juice became slightly bitter. I took my portion out after about thirty five minutes as I felt quite a strong nicotine buzz by that time. The Thunder Raw portions used the standard V2 portion material, which is comfortable but not as comfortable as some other portion designs. The snus was fairly moist, and as a result I felt a rather quick nicotine buzz. Within a few minutes, I had a strong nicotine buzz which reminded me of the feeling I used to get from cigarette smoking. 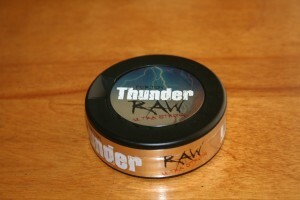 Overall, Thunder Raw Ultra Strong is a good snus with a minty taste. Although I’m not a huge fan of the mint flavor, I really like the strong nicotine kick of this snus. In less than five minutes of putting a portion of this snus in, I’m greeted with a very strong nicotine kick. I recommend Thunder Raw to those who enjoy very strong brands of snus, and also former heavy smokers who feel that regular snus doesn’t quite satisfy their nicotine cravings.